This year Halloween was a little more disorganized than usual for our family. I had a business trip that had me leaving at 2:00 on Halloween. What? I don't get to dress the boys into their costumes? I don't get to take them trick-or-treating? I don't get to raid their candy when they go to bed? We carved pumpkins on the 30th and then set out Halloween costumes so Brian would be set the next day. G was all set with his costume, had it all sorted out. O decided he didn't like the one he had me buy...it was too big. He said he'd be Darth Vader. Then on the 30th he decided I should run out and buy him a new costume. Not gonna happen! I offered again to make his initially chosen costume smaller for him. Nope. How about Darth? Nope. Any of the costumes from the play room....a ninja...nope....Captain Jack Sparrow....nope....a hunter....nope....a construction worker....nope. Then I stumbled across the guitar he'd made for his kindergarten graduation parade....a rock star? YES! So, we grabbed a jean jacket, a too short pair of skinny jeans with a hole in the knee, the paper guitar and some hair paint and he was pleased as punch. Thank God! 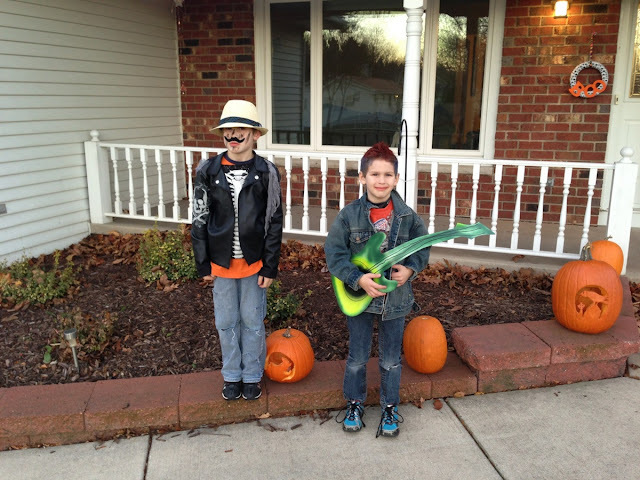 This was not our best year for costumes, but I let the boys have a little more discretion than usual and I tried to keep things low maintenance knowing I wouldn't be home. The skeleton biker guy (yes, that's his technical term) and the rock star. What a big fat bummer that you had miss the Halloween fun with the boys. They looked great! I keep looking for a photo of you wearing your ear warmer!